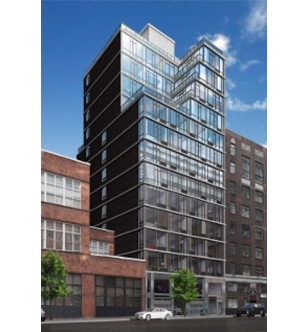 ONE48 is a new 14 floor residential condominium in the Gramercy Park area featuring 55 units comprised of studios, one- and two-bedroom homes, ranging from 400 to 1,175 square feet in size and from $450,000 to $1,650,000 in price. Residences feature spacious layouts, white oak hardwood floors, large storage closets, floor-to-ceiling windows, and custom kitchen and bath elements. Amenities include: a 24-hour attended lobby; a landscaped and furnished common roof terrace with Empire State Building views and a built-in barbecue grill and refrigerator; modern laundry facility; a live-in superintendent; bicycle storage; and on-site Automotion Parking System and state-of-the-art media room.